On Good Friday my wife and I took Sam to the vet. He had urinary tract blockage, common in cats, that two surgeries could not alleviate. We walked into the surgery room with Sam still asleep with the anesthesia mask on. We stroked him, spoke to him, stayed with him a few minutes before the vet came in with the medication to give Sam so he could avoid a painful death. He passed quietly, and we stroked him a long time. Sam had visited the vet’s many times recently, and everyone fell in love with him. He was an incredibly sweet, trusting cat who loved for someone to stroke his belly. We took the body home, spent some time with it before burying it with two other beloved cats in the back yard. My wife ordered a headstone to join the others. Pets become more than pets–they often become part of the family. My wife and I do not have children, so our cats are, in a sense, proxies, although we recognize that they are not human beings. We probably love them as much as any other loved one, and I have not cried this much since my best friend died last year. But I did receive one gift that helped. Three nights ago I felt paws walk over my feet. Thinking it was our other cat, Frodo, I looked up–no cat. The following night the same thing happened. I raised my head, looked across my wife, and a cat sat “meatloaf style” on the other side of the bed. He looked at me. I blinked, since the cat was not Frodo. There was enough light to make out the light patterns of yellow and white–it was Sam. He stayed still a few seconds, then dissolved into the air. Now a skeptic may say that hallucinations can occur in the hypnogogic state between wakefulness and sleep. Or a skeptic who accepts psi may argue that the apparition may be due to my own psychokinesis. But I believe this was a gift, Sam appeared to me to give me comfort, and by God’s grace he was permitted to do so. I have never had a problem believing that non-human animals, especially higher animals, will be raised from the dead. I believe that, if God so grace me that I enter Heaven, that I shall see Sam once more, along with all the beloved pets–and all the beloved people–I have known this side of eternity. “And all manner of things shall be well”–St. Julian of Norwich. Life after Death for Nonhuman Animals? 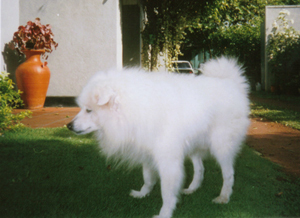 I must have been about seven years old when my Spitz, Fuzzy, died from being hit by a car. I remember Daddy and Great Uncle Bill searching and finding the body near a mailbox. I could not accept that Fuzzy was really gone, and for days I would look for him to come back, jump on me, and lick me half to death, as was his habit. I lost other dogs through the years, and the pain remains to this day. Five years ago my wife and I lost both our cats, Liebchen and Sienna–Liebchen from squamous cell carcinoma of the mouth and, a month later, Sienna, from kidney failure. I was at work when Liebchen was put to sleep, but I helped bury him; when Sienna was put to sleep I was there, crying my eyes out. Sienna used to curl up and sleep on my leg almost every night. The heartbreak in losing both cats was as bad as the heartbreak from losing members of my family. Is there any hope for animal afterlife? Living only with memories and not the hope of a reunion with beloved pets is a painful prospect. Mama had always said that animals didn’t have souls and couldn’t go to Heaven. I disagree on both counts. Many Christian theologians and philosophers have supported the idea of animal afterlife, although one must be careful to distinguish the view that there will be, for example, dogs in heaven from the view that dogs who once lived on earth will live in heaven. Joseph Butler, John Wesley, and C. S. Lewis all supported some form of animal afterlife. Lewis supported the notion that pets who were close to humans would be raised from the dead. In some of his early works, the contemporary British theologian Keith Ward supported animal afterlife. Stephen Webb of Wabash College has defended animal afterlife in his fine book, Of God and Dogs. Several works were written in the late nineteenth and early twentieth centuries on the subject of animal afterlife. Today there are a few popular-level works available, such as Kim Sheridan’s Animals and the Afterlife. My focus, however, is on philosophical and theological reasons (within Christianity) for supporting an afterlife for individual animals. First, the notion that animals do not have souls is a modern one stemming from Rene Descartes (1596-1650), who thought animals were nonfeeling, nonthinking automatons and that only human beings have souls. But earlier thinkers, from Plato to Aristotle to St. Thomas Aquinas, all believed that animals had souls in the sense of a wholeness that is more than the sum of their parts. Aquinas believed that the souls of animals were destroyed at death, but he was not aware of modern research on animals that suggests that they have rudimentary reasoning ability. The ape-language studies of the 1970s were controversial, but more because of a backlash from neo-Cartesians who believe, like Descartes, that animals are automatons. Despite the objection that the apes were just emulating humans or picking up subtle body language, the evidence of real communication through language seems to be the stronger position. Birds have shown a great deal of intelligence, especially parrots, and one (who is now dead) could speak, apparently using not just syntax, but also semantics. Animals have shown some basic math ability. Many animals use tools. It is clear that they are conscious at some level; whether they have self-consciousness in the same sense as human beings is difficult to tell. From my experience of dogs and cats, they reveal their individual personalities so strongly that the idea of them being resurrected with those same personalities and memory patterns does not seem absurd. I do, after all, believe in an omnipotent–and loving–God. Surely He would raise up the animals we love, our beloved companions such as dogs, cats–and other animals that are objects of our love. But unlike C. S. Lewis, I believe that God might raise up other individual animals as well. Animals suffer a great deal–both by the hand of man and from the natural cycle of the food chain. An antelope caught by a lion isn’t saying to itself, “Boy, this feels great! Just what I wanted today, to be killed by a lion!” Instead, the antelope really feels fear and pain. It is only human presumption that denies that it anticipates such pain. And with so many animals damaged in cruel experiments (such as rats which were made to run or drown–until some died of either exhaustion, stress, or sleep deprivation), animals require justice. Raising up the species will not provide justice for individual animals. If animals have some sense of selfhood, even if not as developed as human beings, and could appreciate continued life, then a good God could raise them into a world without suffering. In that world these animals could live in peace with one another and with human beings–a subject of so many great works of art in the Western World–“the Peaceable Kingdom.” Best of all, we have every reason to believe that we will see our beloved companions again. Two years ago, I was visiting my aunt’s church, which is across the street from where Fuzzy was run over. I was thinking about Fuzzy. Suddenly I saw a large white Spitz, the spitting (sorry about the pun!) 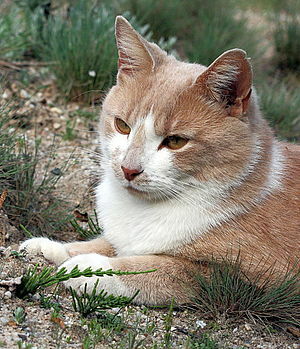 image of Fuzzy, who crossed the highway and went behind a house–the house where Fuzzy had visited a female friend–and where he was going when he was killed. Now this may well have been a dog who lived there or somewhere else in the area. I looked behind the house–no dog–and in subsequent trips I have not seen him since. That experience I leave as a mystery–at the very least it was a nice coincidence or “synchronicity,” to use Jung’s term. Perhaps it was a foretaste of the future. I hope so.